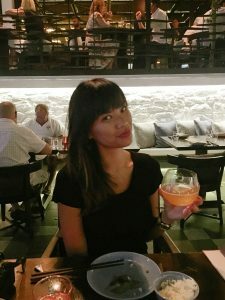 At Ling Ling Mykonos, the combination of urban design, style, and a menu any Asian foodie would crave made it hard to believe I was still sitting on a Greek island. Then again, I was dining on Mykonos. 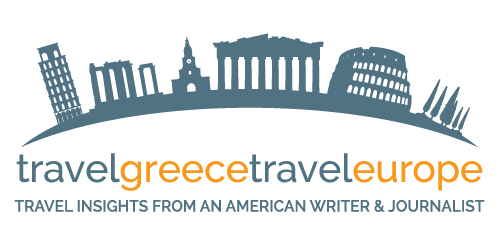 If there’s any Greek island that could carve out such a well-executed experience comparing to the likes of London’s or New York’s best restaurants — it’s here. 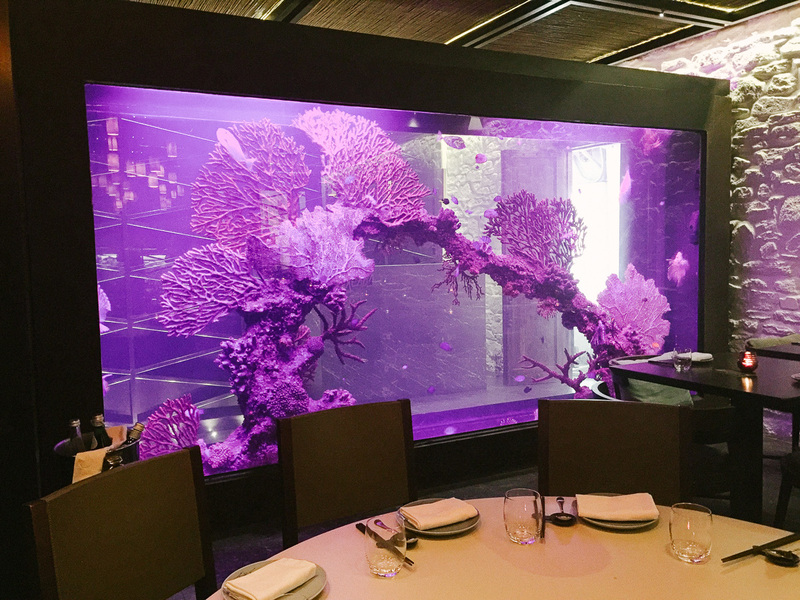 A gorgeous, glowing aquarium greeted us at the dimly lit entrance as we walked in. Dance and house music filtered out. You’d think we were heading into a club but we had reservations for one of the premier restaurants in Mykonos Town. 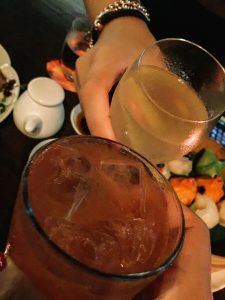 A symmetrically stylish indoor bar space opened up before me as well as a dining tables that encircled a view of a lower-floor courtyard flanked by purple bougainvillea and a spritely olive tree. That’s where we were seated for dinner, an open-air space that embraced contemporary décor but with surroundings that incorporated Mykonos’ special island vibe. 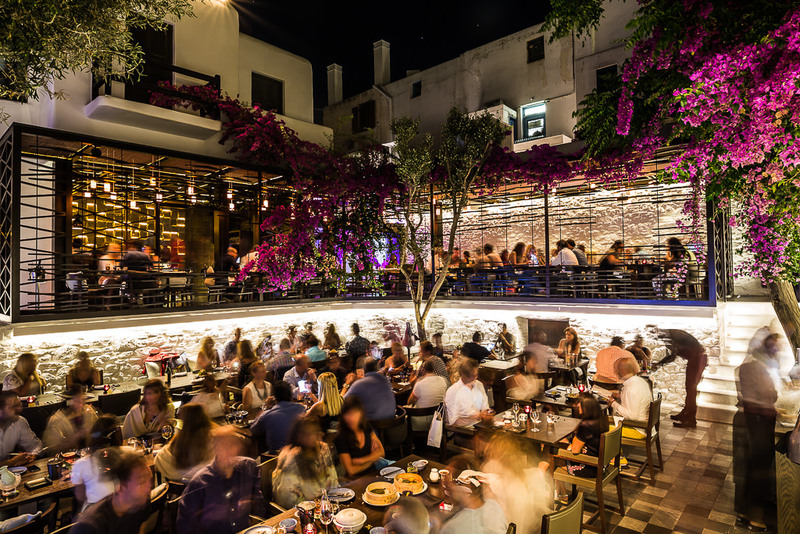 Eating out under the stars is something you have to do while in Greece. 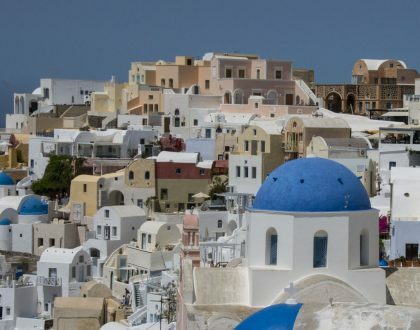 Plus, the whitewashed walls that enclosed part of the courtyard reflected the charming architecture of the Cycladic islands. Gobo lighting seemed to bounce off of them – reminding me that – yes – this place is about showing off a unique modern ambiance too. 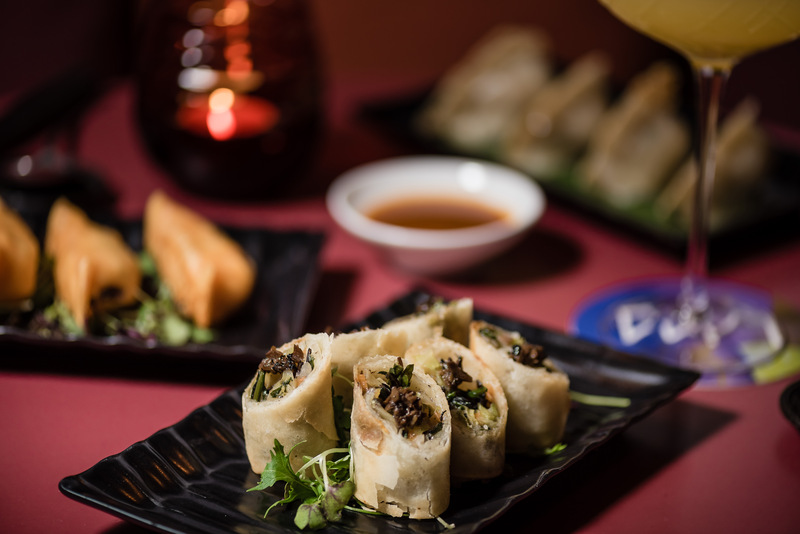 Ling Ling is a Hakkasan property, with cuisine inspired by the Michelin Star award-winning Hakkasan restaurant. 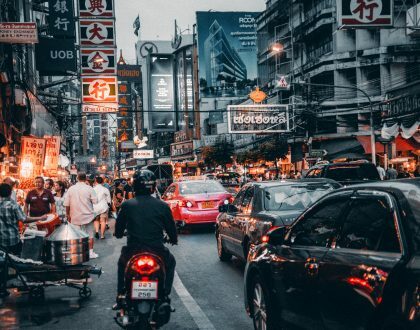 Hakkasan first opened in London in 2001 and since then has grown to 12 locations around the world including Miami, New York City, San Francisco, Las Vegas, Beverly Hills, Shanghai, Dubai and recently – Mykonos. 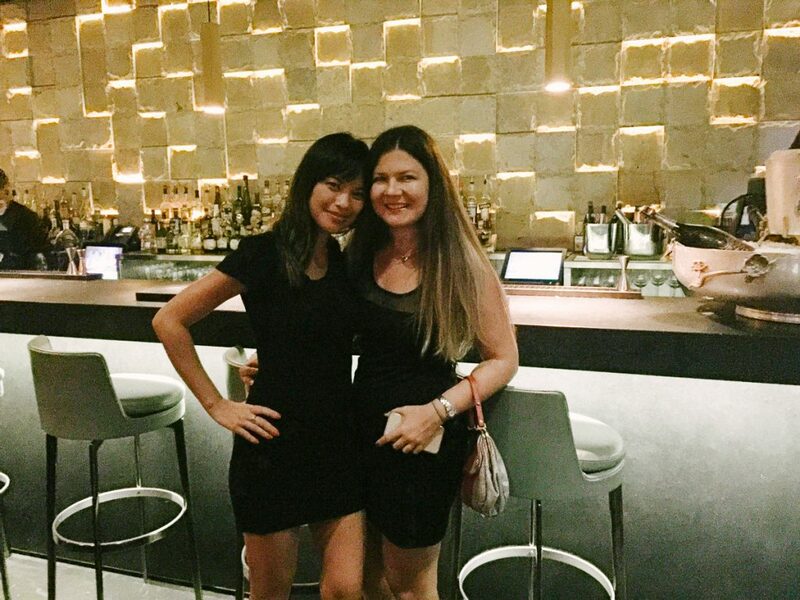 Dining at Ling Ling with fellow travel blogger Elena of Passion for Greece. I loved the music. I happen to be a fan of dance and house, so the soundtrack seemed to fit perfectly with the overall style of the place. In fact, the London location has hosted Calvin Harris, Nervo and Tiësto. Ling Ling’s menu is Cantonese but interestingly incorporates some local ingredients of Greece. For example, I spotted a truffle vegetable roll incorporating stamnagathi, a wild green from Crete. As you must on Mykonos… We started off with choices from the bespoke cocktail list. I opted for the Rasperry Apple Mai Tai with Diplomatico Blanco, Diplomatico Manuano rum, Cointreau, raspberries, apple, almond and lime — very light and refreshing. 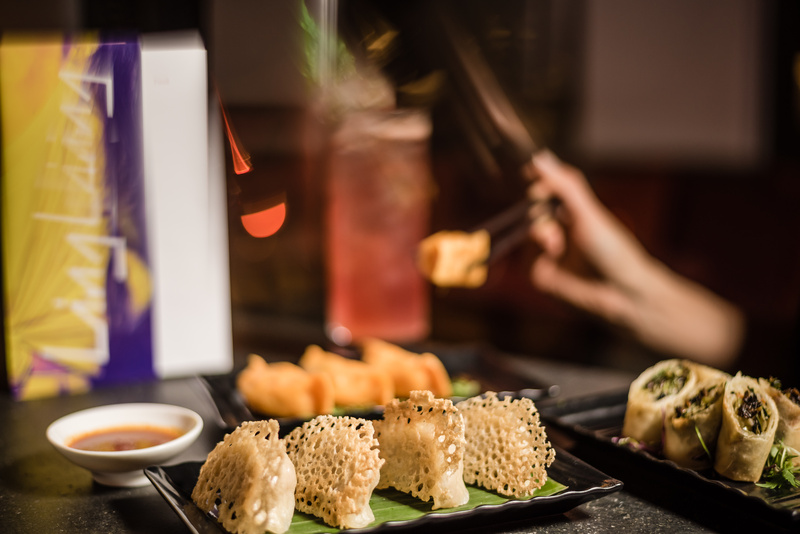 To start, we choose a Supreme Dim Sum platter which included lobster, king crab, sea bass and Mediterranean and prawn truffle dumplings. As an Asian American, I’ve had my share of dumplings. The best dumplings I’ve had were during my visit to Hong Kong. Then, I’d rank New York, Seattle and San Francisco as the next contenders for memorable dumpling moments. The dumplings at Ling Ling were beautifully presented and tasteful – not the best I’ve had – but decent. We also had a taste of the Alaskan King Crab appetizer dish accompanied by a Szechaun pepper sauce. Delicious. 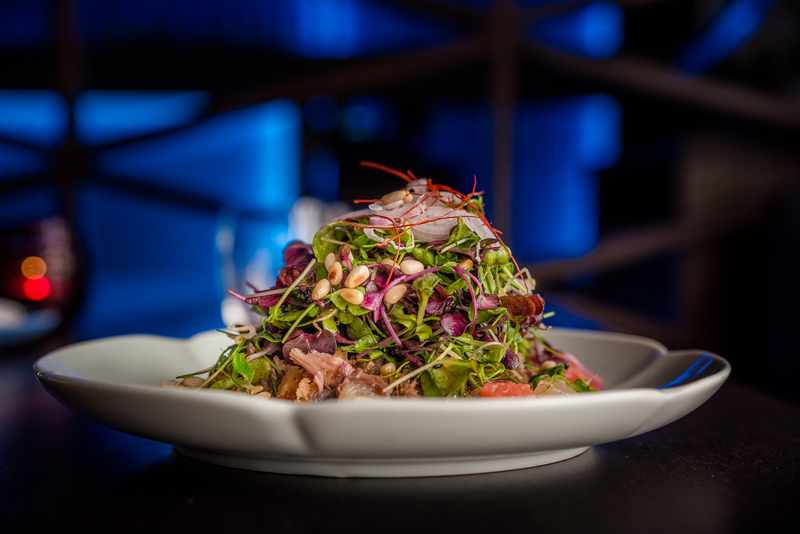 Next, we savored a Crispy Duck Salad with pomelo, pine nuts and shallots. This was my favorite dish. The duck preparation reminded me of some of the favorite authentic Chinese meals I’ve eaten. The salad mix, which incorporated Mediterranean ingredients, worked beautifully, and I think that made this salad quite special. For a main, I enjoyed a Rib Eye Beef Platter with a spicy bean sauce. Dessert at Ling Ling Mykonos turned out to be a creative presentation. The desserts impressed with just enough sweetness. Nothing overdone. The Namelaka Yuzu which was a combination of coconut sorbet, sesame crumble, yogurt tuille and meringue. We were also presented with Black Tea which had chocolate “sand,” tea mousse, green apple and peanut caramel. Dessert is not to be missed at Ling Ling Mykonos. 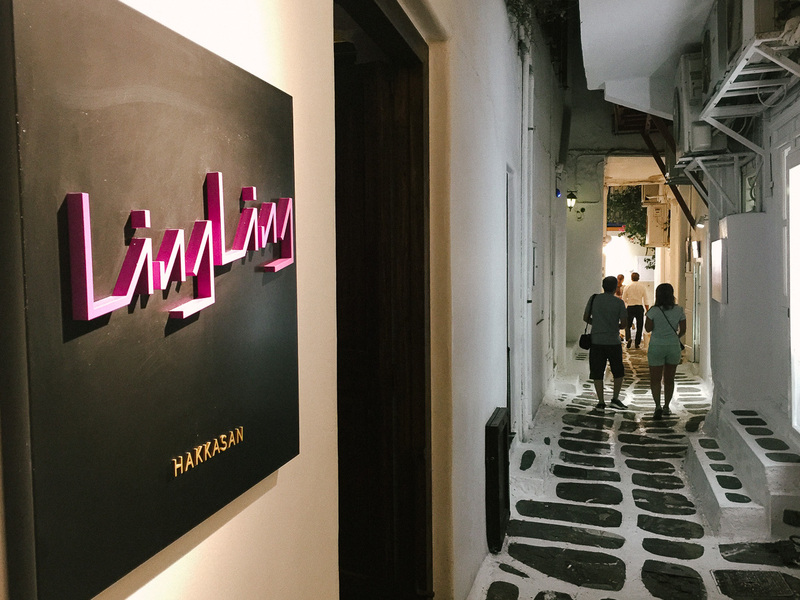 Ling Ling Mykonos is one of the “it” restaurants belonging to Mykonos Town’s growing cosmopolitan nightlife scene. 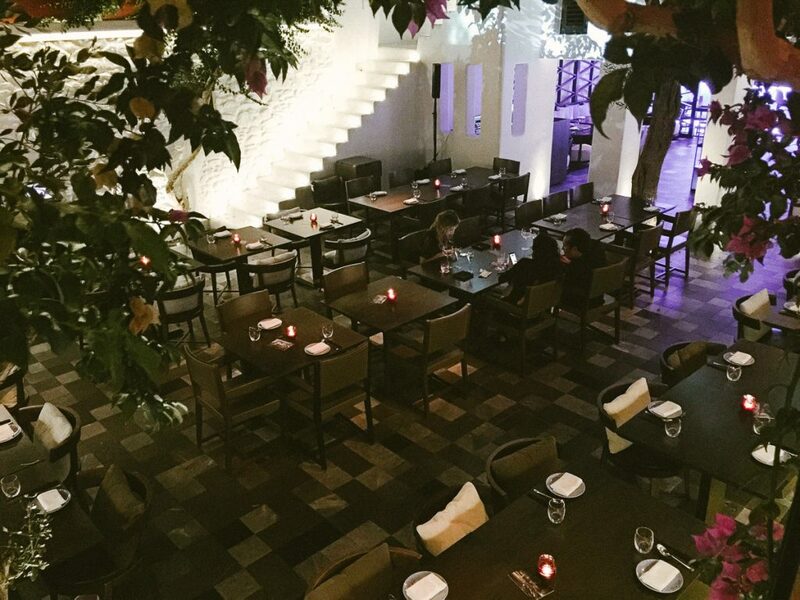 The place is a stylish, spot-on combination of Mykonian chic and big city glamour. 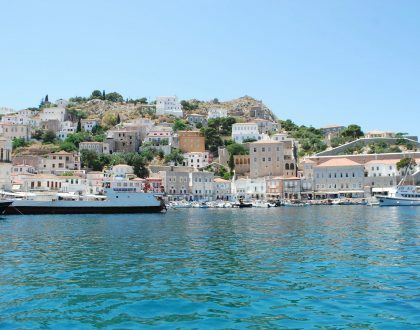 A great dining experience to have on this Greek island. 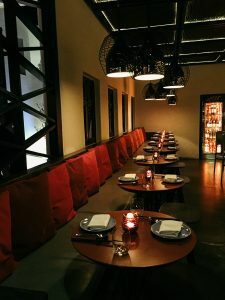 The well-dressed staff are professional and some dishes are a unique, well-thought out blend of Cantonese and Mediterranean cuisine. Mains start at €30. Reservations recommended. For more a rundown of tips about what to do, where to eat on Mykonos, where to stay on Mykonos, and other travel experiences on Mykonos, check out my Mykonos mini travel guide page on this blog.